Time is a funny thing. People are living longer than ever before due to medical advances, yet somehow we have less time in the day to get everything done. We are running around left and right without being able to stop and think about where we really want to be running to. Having the time to be strategic about your actions is becoming an elusive idea. Just think about eating dinner on a weeknight. If you are anything like us, it is not a well-planned, homemade meal. It’s a smorgasbord of things from your fridge dumped in an instant pot, or a fresh from the microwave courtesy of Marie Callender’s. Now, we understand cooking a full meal is simply not in the cards for most people; however, that doesn’t mean you can’t be more strategic about what you eat. Services like Postmates solve this dilemma. Now, you can get real food delivered to your doorstep exactly when you want it. With Postmates, each family member gets the meal they want, when they need it and you can spend more time enjoying your family rather than throwing together a meal. So how does this relate to multifamily? Most property management companies (PMC’s) have agents manually sort their leads every day. Agents would need to set aside 30 minutes to 2 hours to thoroughly sort through their leads every day depending on the side of your property. This means most agents are forced to either follow up with a lot of prospects without a strategy or only follow up with a few prospects in a very strategic manner. Similar to choosing between spending an hour in the kitchen cooking a well-thought meal or just eating whatever is convenient. Both of these options leave a lot to be desired. The first step in prioritizing leads is understanding what criteria to sort by. We recommend taking a number of factors into consideration. We have ranked the top 10 factors to consider when organizing your lead list and categorized them based on urgency. There are some prospects that should be followed up with asap. We put these prospects in the ‘Drop everything’ category. We consider prospects that have called, emails or are brand new to be the most urgent. Calling is what most people do as a last resort. If I receive a call from a friend, you can almost guarantee it is some sort of emergency. So, we believe prospects who have called you should be followed-up with first. Right after you have followed-up with prospects who called, you should respond to prospects who emailed you. While email is a more relaxed medium of communication, any prospect actively reaching out to you should receive immediate attention. New prospects are at the first step in their home search. Your agents need to reach out to new prospects quickly to set your property apart from your competitors. This is especially important for prospects looking to move in the next 2-4 weeks. The ‘follow-up today’ prospects don’t require immediate attention, but should be contacted within 24 hours. 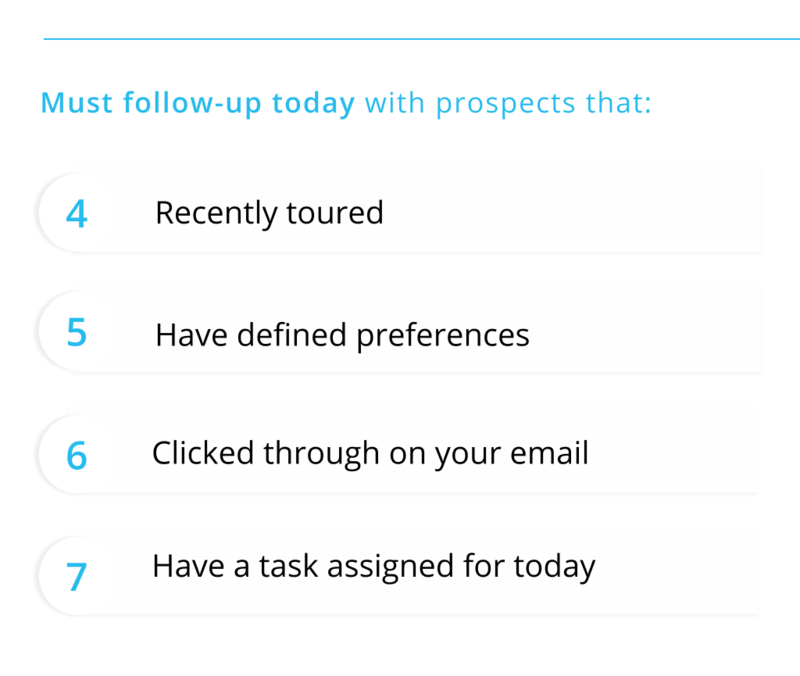 These prospects have recently toured, have defined their preferences on your website, clicked through your email, or have a task assigned for today. Prospects that have recently toured your property should be followed up with regularly. This is your last chance to convince these prospects to rent with you. It is vital that your agents are able to quickly respond to any last-minute questions your nurtured prospects may have and stay top-of-mind as they make their final decision. Prospects that are searching for a specific date range, price and/or bedroom preference on your website are going to be easier to sell. Due to their unique needs, they have a smaller pool of properties they can sign with, which means the chances of them signing with your property is increased. Your agents should be reaching out to these prospects to take advantage of the reduced competition. Any prospect that has clicked through your email is showing interest. Your agents should regularly follow-up with these prospects to keep these prospects engaged. Tasks are reminders that your agents set for themselves. These tasks could be something simple like sending a new prospect information on the amenities or something more urgent like a new quote. Prospects with tasks scheduled for today should be near the top of your list. Not prioritizing these prospects is the equivalent of making a note in a planner you never check. 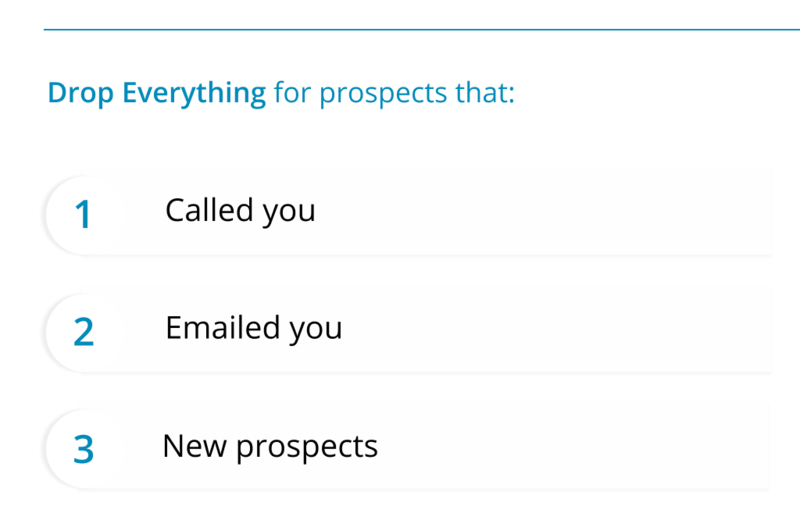 Prospects in the ‘follow up today or tomorrow’ category should only be contacted after prospects in the first two categories have been addressed. This category is designated for prospects who it would be a good idea to follow-up with, but are less likely to convert into a lease. 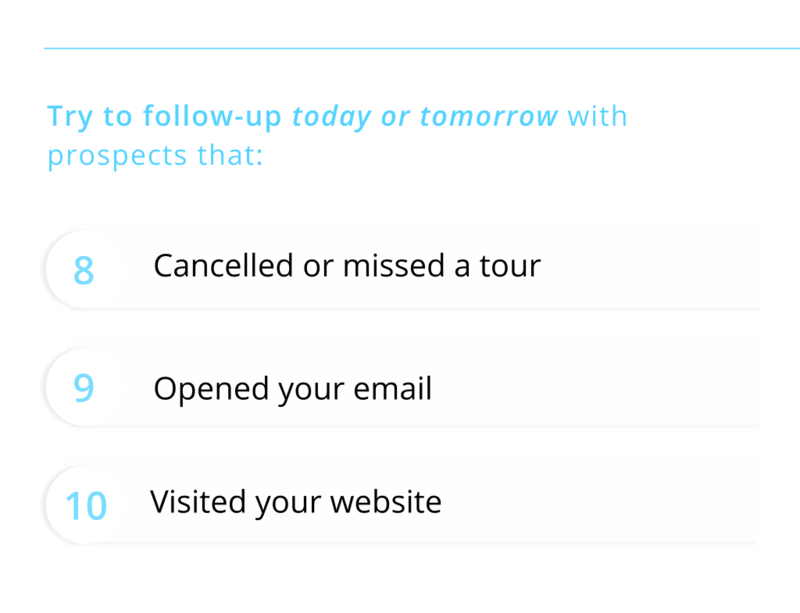 Agents should reach out to prospects who have cancelled or missed a tour. These prospects were interested, however, they aren’t committed enough to show up. Agents should try to reschedule within a week of cancellation. Opening an email is a good sign, however, its is a long way off from signing a lease. Prospects that have opened an email should be contact by an agent within a week or so. Similar to opening an email, a prospect that has visited your website is interested in your property, but is still in the early stages of their search. Agents should try to follow-up with these prospects within a week or two. As you can see, there is a lot that goes into prioritizing leads. We don’t have an exact number of hours agents would need to spend on sorting their leads every day, but I think we can agree it would add up quickly. It would be ill-advised to make your agents suffer through prioritizing leads by hand or follow up with your leads without a strategic plan. Instead, try looking for a CRM tool with auto-prioritization built in. There are a lot of options out there that can save your agents a lot of time every day, and improve your conversion rates by ensuring agents are following up with the right prospects at the right time. During your search, be aware that all auto-prioritizing CRMs are not created equal. We recommend using a system that takes our top ten factors into consideration. To learn how your agents can take this one step further, read our guide on autonomous prospect communications.